This is the only existing musical clock made by Peregrine White, an important early American silversmith and clockmaker working in Woodstock, Connecticut. It was made for Asahel Carpenter (1731–1809), who lived in a section of Old Rehoboth that is now part of Seekonk. Asahel was a wealthy farmer who owned large amounts of land, much of it in Ohio. His granddaughter reported in 1880 that he had “moved in the highest circle of society,” which might explain his commissioning of an elaborate musical tall case clock. Asahel bequeathed the clock to his son Wooster Carpenter (1777–1858), initiating a tradition in which the clock has been passed down through four more generations of Carpenters. The clock plays seven tunes, including Nancy Dawson and Handel’s Minuet, which are listed on the arch of the Boston-made painted iron dial. Once the selector hand is manually moved to the listener’s choice of song, the clock plays the tune three times through on every third hour using ten hammers on ten bells. 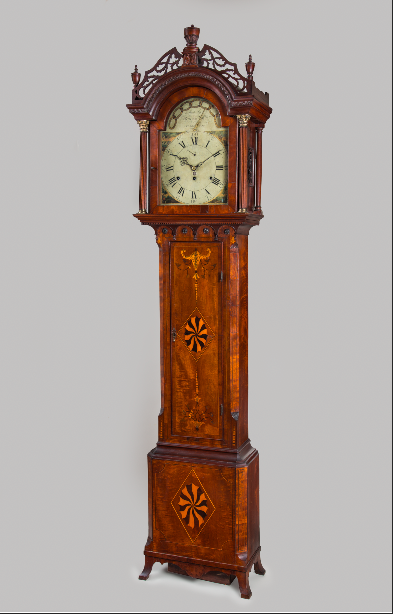 Peregrine White made very few clocks in general, but those he did produce are considered of the highest quality. A respected clock conservator said recently that this is the best musical clock that he has heard. The case housing the clock is attributed to Nathan Lombard, a very important early American cabinetmaker from Sutton, Massachusetts, the town where Peregrine White was born. The carved elements and flaring French feet, which at first seem out of place on a Federal-style case, characterize his style. Lombard is also known for creating intricate inlays, seen here in the elaborate floral motifs on the front of the case.